Right now — I don’t want anything to do with Readability. I am, however, going to let things cool down before making a final decision. Like Brooks, I’ve never been comfortable with the way they collect money on behalf of publishers. And their app is nowhere near as good as Instapaper. 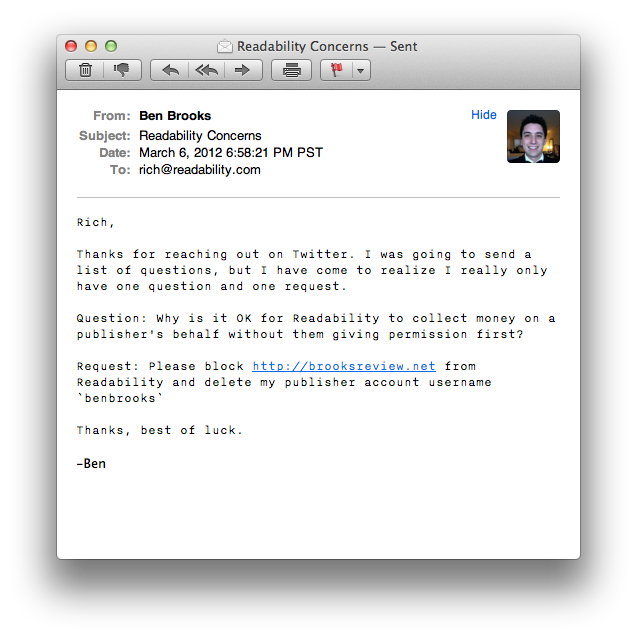 I didn’t want to make a decision that day, but as I read more and more about Readability it made me sick. As of this writing I still haven’t heard back, but I also used the contact link in the help section to request that http://brooksreview.net be blocked from Readability and that my publisher account be deleted — you see unlike a user account there is no cancel account link. Again, as of this writing, I still have not heard back and http://brooksreview.net is still not blocked, my publisher account is also still active. If you don’t want your website content to be available in Readability view, you can exclude your content from being processed by contacting us directly. We’re always happy to help. Except I asked them to do this five days ago and not only has it not happened, but they seem to just be ignoring the request. Update: Chris Dary of Arc90 responded to me on Twitter and got me opted-out. Thanks to him for that.